Burkeway Homes, was today granted planning permission for an exciting new 197-unit residential development. This 18-acre site is situated in the quant suburban coastal village of Bearna. With a Gross Development Value of €60 million, this impressive new development is due to commence in January, with Phase 1 house sales launching in Spring next year and new homeowners expected to receive keys to their new home in Spring 2020. Working with award-winning architects McCauley Daye O’Connell, this Burkeway Homes development will comprise a mix of four bed detached, three and four bed semi-detached, two and three bed terrace homes, two bed townhouses and one, two & three bed apartments. This development, which is only 500m from the picturesque Bearna village, is the perfect location for first time home-owners or couples and families looking to find a quality home in a magnificent setting. 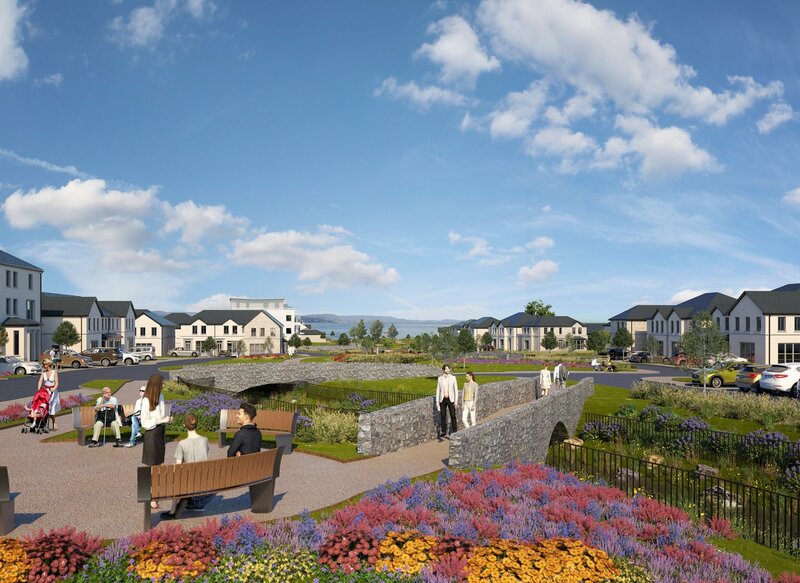 With a backdrop of gorgeous pier and quaint leafy roads, this new Bearna development fuses rural and urban, which is unique and special in such close proximity to Galway city. Residents will not have to travel far from their new homes with sumptuous restaurants, sports clubs, shops, salons and supermarkets all conveniently located on their doorstep. There are also a number of excellent schools, with jam-packed curriculums, to choose from, with Gaelscoils particularly strong in this well-known Gaeltacht region. Open space spanning four acres will include a crèche, outdoor putting green, playground, all weather surface for year round play, and tranquil walks and parks located on the banks of the Truskey Stream, which runs through the centre of the development. As the environment and context play an important role in our design and planning process, another stand-out feature of this development will be an existing old walled orchard, which is being restored and preserved as a gorgeous walled garden.